I'm wondering if there is a setting thats causing many of my database schemas to have duplicate items, though only one of each pair can be expanded. 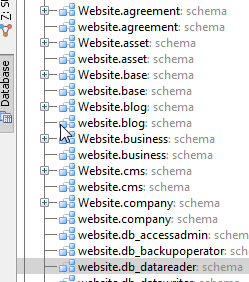 My schema's are connected to an SQL Server instance with jTDS. Of course, I just figured it out. But for the sake of others, It did this because the database parameter in my connection string didn't use a capitolized W. If you notice the non-expandable duplicates are lowercase whereas the actual database name is capitolized. That worked for me as well, good catch.